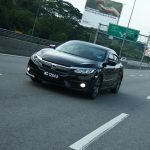 Here comes the all new 10th Generation Civic. A fastback design, which is new to the Civic nameplate. The Civic started life as a small hatchback and expanded in all areas to a sedan. 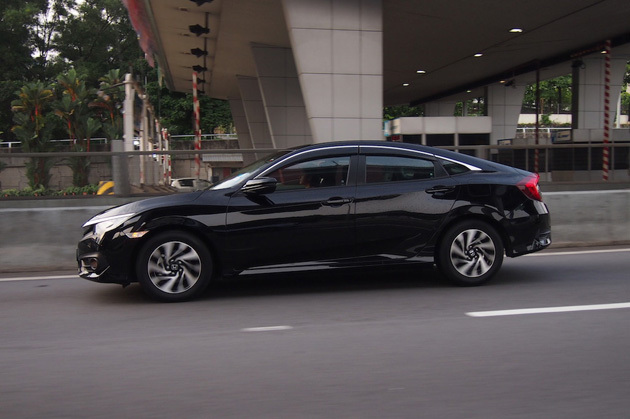 Now this 10th generation Civic carries a silhouette of a sporty fastback and it has grown in size. Measuring 4,630 mm in length, 1,799 mm in width and a height of only 1,416 mm, this Civic is lower and wider which provides good stance. 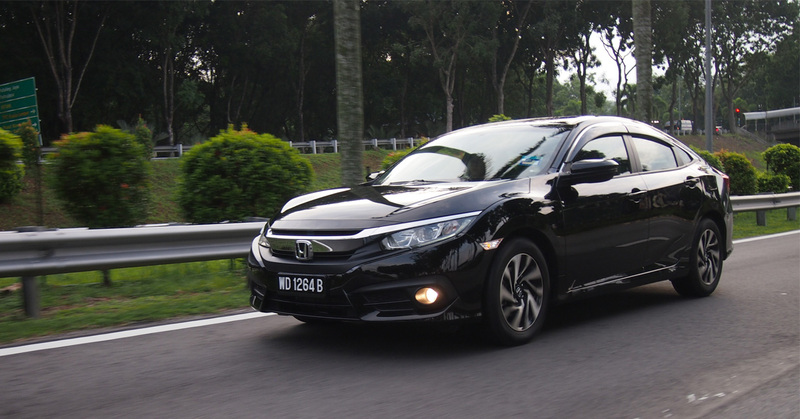 With this dimension package, this Civic delivers exceptional stability on the road, ensuing for more confident driving during acceleration and corners. 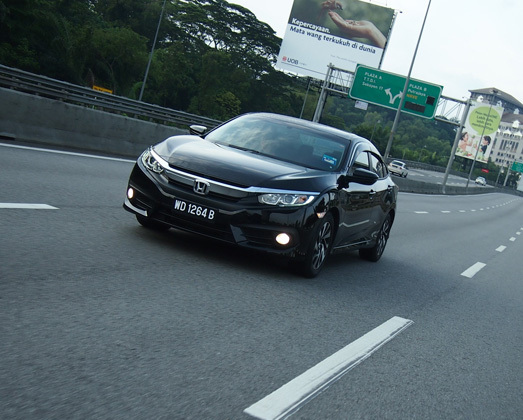 The redesigned ‘Thin A’ pillar of this Civic, offers an excellent viewpoint for the drivers. 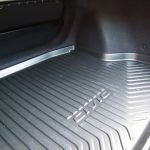 The rear seat foot space width has also been increased by 27 mm compared to the current outgoing Civic. 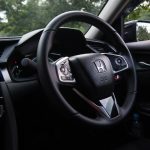 This new Civic interior takes the refinement of Honda’s most affordable sedan to a new level with high-quality premium touches and upscale materials applied liberally throughout. Highlights include a soft-touch instrument panel upper surface, door pad deck seams and soft door upper panels. Fit, finish and materials have received close attention and is class impressive. 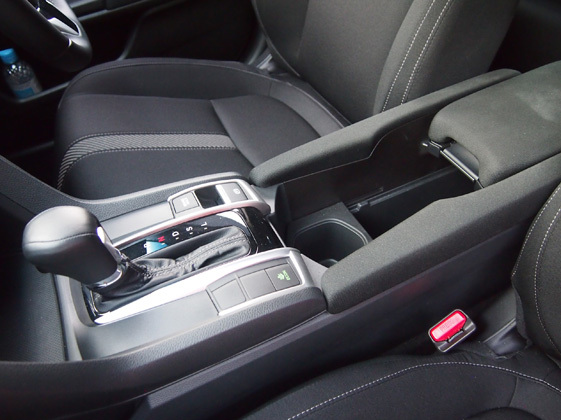 All important systems and controls in this Civic are positioned within easy reach of the driver. Controls for the systems used most frequently – audio, cruise control, Bluetooth® HandsFreeLink®, available navigation system with voice recognition and intelligent Multi-Information Display are conveniently positioned on the steering wheel. The main instrumentation is an easy-to-read digital system with graphic displays. 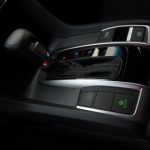 Typical of Honda interior design, the soft-touch switchgear of the Civic is engineered to deliver a high-quality feel. The center console is specially engineered to offer a sporty appearance coupled with the versatile usability. There is a 2-tier smartphone tray with a wire management pass-through for organized connectivity. 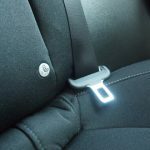 It has a rubber mat to help secure a phone and include LED lighting for nighttime visibility. 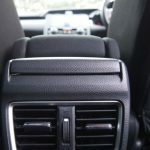 There’s also an additional phone storage pocket on the driver’s side. 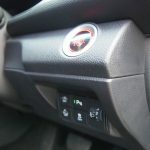 The new electronic parking brake replaces a conventional manual parking brake lever, freeing up more console space for a larger armrest and greater storage space. 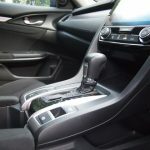 The main storage compartment is topped by a sliding, deeply padded armrest that features an added inch of adjustability, compared to the previous Civic. 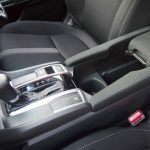 A pair of cup holders are centrally located, and can accommodate large 42-ounce cups when the padded armrest is placed in the rearmost position. By sliding the adjustable cup holder rearward, there’s space to accommodate even a large sports drink bottle. Inside the console, a small item tray slides fore and aft the full length of the console. With the cup holder removed, the console offers a class leading 7.2-liters of storage, enough to accommodate iPads and other large items. 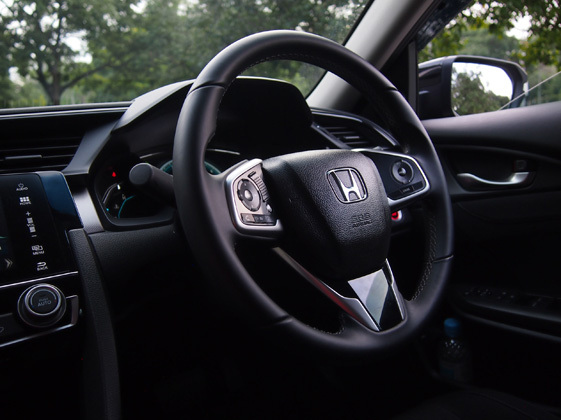 The driver gets an “Advanced Interface” via its 7” Advanced Display Audio is completely redesigned to be the most convenient and connected Civic cabin entertainment system ever. 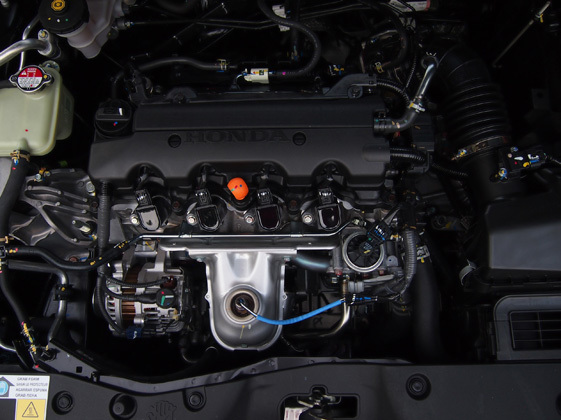 Under the sporty hood, this Civic get two engine choices. 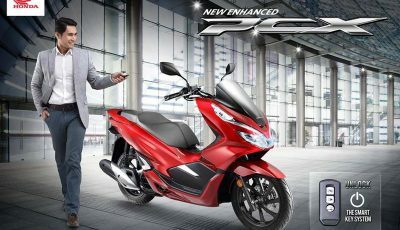 For the first time in Honda Malaysia’s line-up a brand new 1.5L VTEC Turbocharged engine. 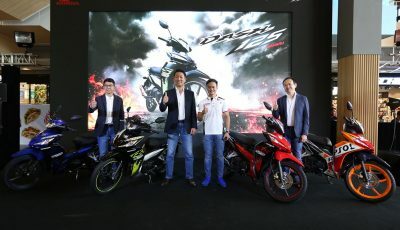 This engine delivers 173PS and 220Nm of torque which is equivalent to a 2.4L engine performance. There is also the 1.8L i-VTEC engine which produces 141PS and 174Nm of torque is fitted with CVT for a smooth driving experience. 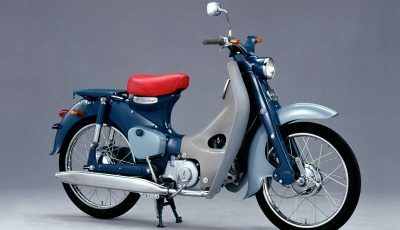 We are test driving this version here. From ignition it is quiet smooth operator. 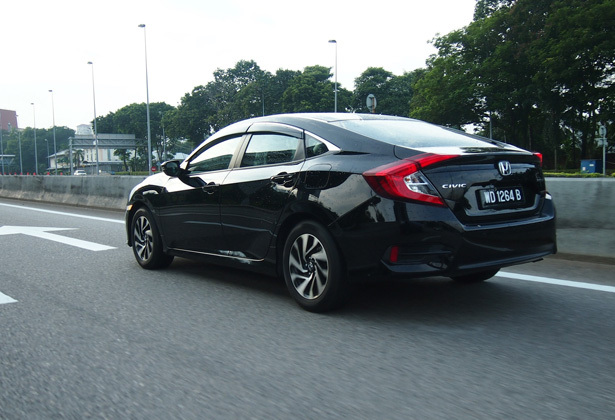 The CVT works very smoothly to deliver progress and despite the new Civic size and weight, it does not struggle or hesitate when the driver ‘calls’ the power. 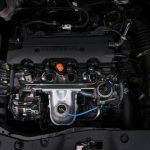 This 1.8L is a tried and tested engine and in this 10th generation Civic, it would be the best pick unless you really need the additional 32ps in your daily commute. We liked this 1.8L version also for its fuel sipping and unless pushed hard, its sips little fuel and keeps your trips to the petrol station to the minimum. Do not worry, it will not sell out completely as there are more and more being made everyday. However, you might want to get to won and rive one before it gets superseded by the 11th generation Civic.